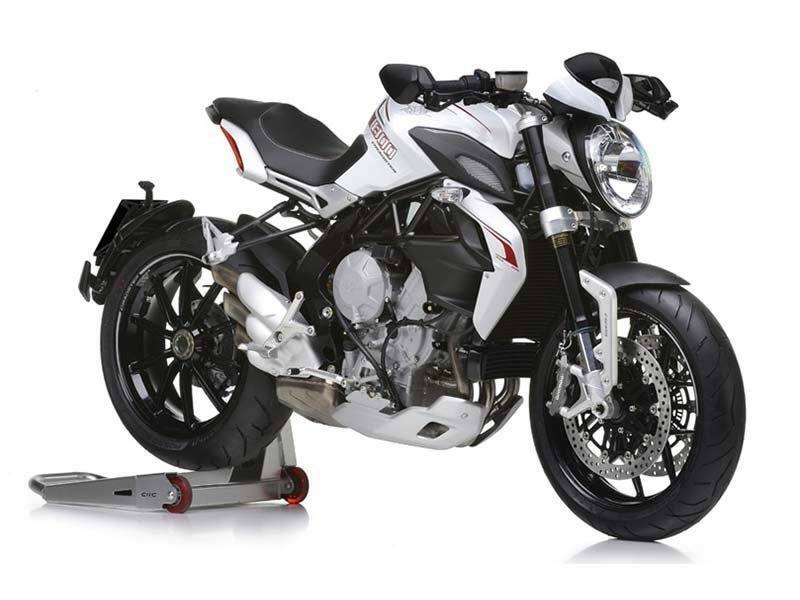 MV Agusta continues to expand its motorcycle range: after introducing the Rivale 800, a symbol of motard-style sports appeal and ultra-dynamic road performance, the new Brutale 800 Dragster makes the term 'motorcycling passion' breathtakingly tangible. No mere means of transport, a motorcycle symbolizes freedom, our need to get out there and explore, to savor mile after spine-tingling mile and experience every second of that freedom to the max. The new Brutale 800 Dragster embodies the ambitions and dreams of every biker and transforms them into on-the-road reality. Electrifying, unforgettable moments. 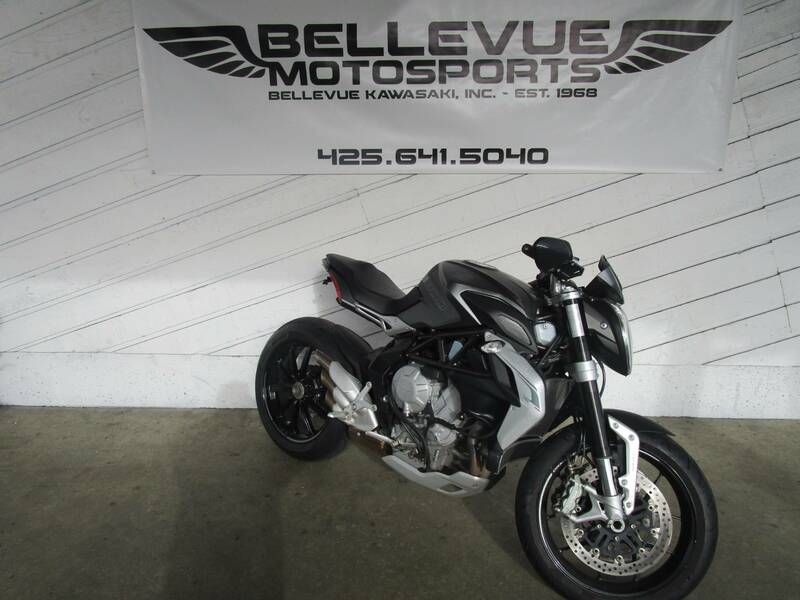 The three-cylinder Brutale 675 and 800 have introduced countless riders to the awesome buzz that goes with riding a high-performance naked bike. Outstanding ridability, controlled power, lightness, eye-catching design, and exceptional value for money. This unmatched combination has made the 3-cylinder Brutale a huge success. Now, the Brutale 800 Dragster takes a big step towards the future, yet does so with an attentive eye to the past. The most extreme Brutale ever is no fan of compromise: irreverent and brash, it is essential, brusque, outspoken and irascible. Packing a powerful punch, the Brutale 800 Dragster takes exhilaration to a whole new level. At the same time it draws on the ideas that shaped the first four-cylinder Brutale bikes, the very essence of the naked concept and monuments to incomparable styling. The Brutale 800 Dragster embodies both experience and intuition, symbolizing motorcycling past, present and… forever. Pure essence. Pure thrills. 100% Brutale. 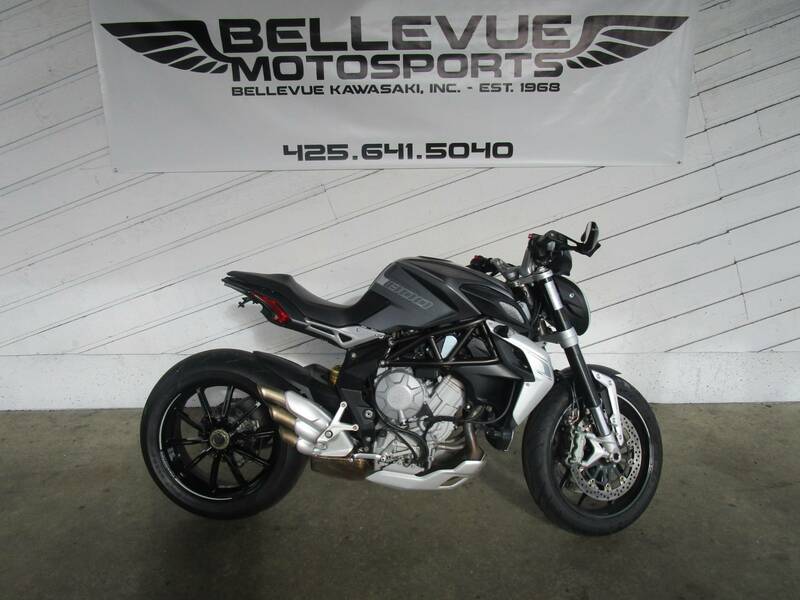 With consummate Italian craftsmanship, the Brutale 800 Dragster re-evokes the epic spirit of the “dragster” race bikes, specifically built to unleash their explosive power in the few seconds that separate clutch release from checkered flag. Seconds as scorching hot as the rubber left fuming on the tarmac. Seconds that end in the blink of an eye yet generate thrills to last a lifetime. The Brutale 800 Dragster flings open the doors to full-on freedom. On two wheels. Or even just one. The frame configuration, which has characterized the three-cylinder platform since its inception, features an ALS tubular steel load-bearing structure, supplemented by lightweight aluminum alloy plates. This combination forms part of that production flexibility concept which inspired the three-cylinder project and consequently allows the design of specially-developed frames for each model without disrupting the underlying look or essence. Note that this same set-up has characterized MV Agusta models since the launch of the astonishing F4: today's three-cylinder Italian-built MV Agusta bikes offer up an even more highly evolved version of the concept. The front, tubular section employs a steel alloy with exceptional metallurgical qualities that, while extremely lightweight, provides outstanding torsional stiffness, especially in those areas most subject to stress, such as the steering head. The aluminum alloy plates close off the structure at the rear and act as the fulcrum for the single-sided swingarm. A compact wheelbase of just 1,380 mm, identical to that of the Brutale 800, strikes a perfect balance, ensuring both excellent handling and stability; the 95 mm trail boosts the already outstanding front end performance, making for enhanced ridability and bike control. 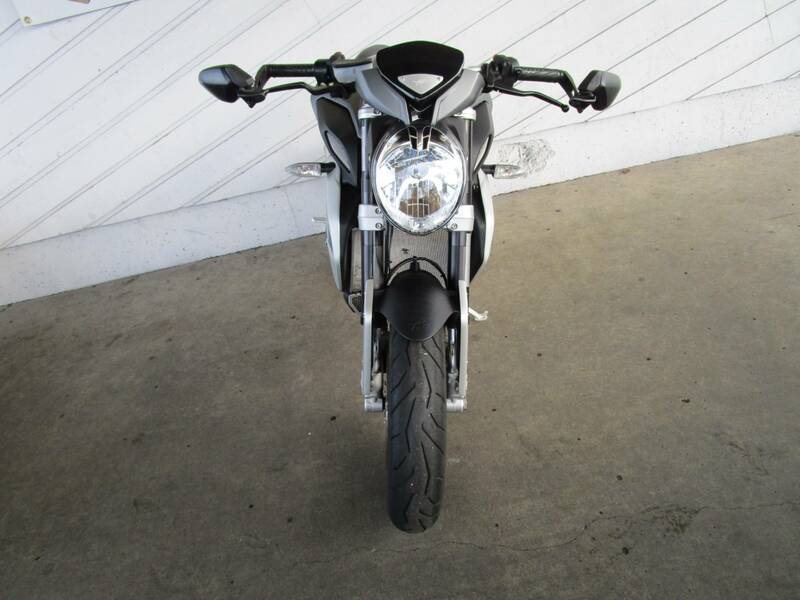 Another eye-catching feature perfectly in keeping with the Brutale 800 Dragster design ethos is the attention grabbing Pirelli DIABLO Rosso II rear tire, having a width of 200 and a shoulder of 50. The suspension system features fully adjustable units, allowing personalization of compression and rebound settings, as well as providing a selection of spring pre-load options. The Ø 43 mm upside-down Marzocchi fork offers 125 mm of travel; the Sachs rear shock gives the single-sided swingarm - also in aluminum alloy - 125 mm of travel. The seat, with a height of 811 mm, has been redesigned to improve comfort and function: it also boasts a craftsman-like finish with stylishly stitched seams. The rider can also count on even more functional foot pegs and supports, and new heel guards which, just like the wheel rims, have been specially customized for the Dragster. Equipped with first class Brembo components, the braking system relies on a pair of Ø 320 mm floating front discs, equipped with four-piston calipers (Ø 32 mm); the rear unit, instead, has a Ø 220 mm steel disc and mounts a 2-piston caliper (Ø 34 mm). The new MVICS (Motor &amp; Vehicle Integrated Control) injection-ignition system features the very latest software and an engine control strategy first implemented, with great success, on the Rivale 800 and now extended to the entire three-cylinder&nbsp;range. MVICS also features the Eldor EM2.0 engine control unit and a Mikuni Full Ride-By-Wire throttle body. The fully integrated management allows, via the instruments and the handlebar switches, easy adjustment of numerous user-settable parameters. 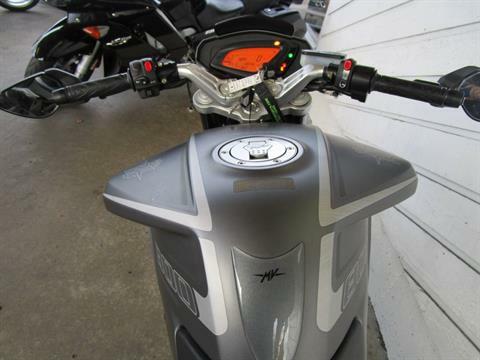 More specifically, the system lets the rider configure the torque setting with&nbsp;four different mappings. Three of these are set directly by the manufacturer and named according to the relative riding conditions (Sport, Normal and Rain) while the fourth leaves the rider free to define, within established limits, all the individual parameters: engine response, rev limiter, engine torque response, throttle sensitivity, engine braking. 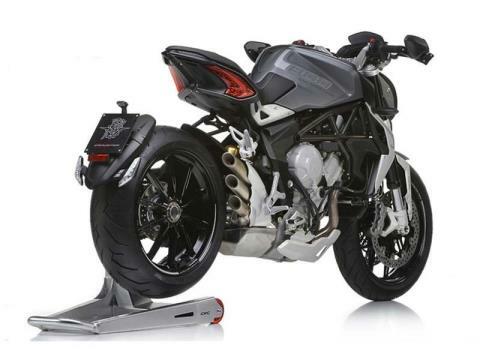 As one would expect, eight-level traction control (which can be disengaged) is also included: the relative algorithms have been tweaked to perfection for maximum precision, a must on a bike such as the new Brutale 800 Dragster as one of its defining characteristics is astounding acceleration. 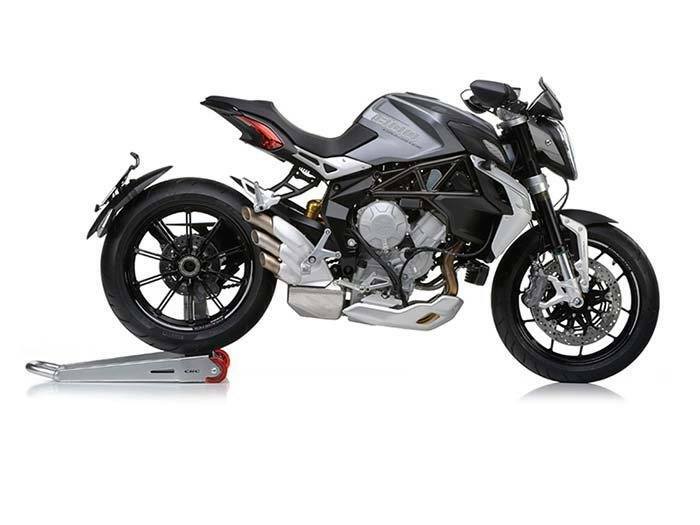 Engineering at the service of manufacturing efficiency: the 3-cylinder MV Agusta platform demonstrates how conscientiousness at the concept and design stages can result in the development of completely original models from the same, shared technological basis. The new Brutale 800 Dragster is no exception to that rule, once again highlighting the versatility of the cutting-edge MV Agusta platform centered on the three-cylinder engine - the power unit that has made the greatest developmental progress in its market segment. The goals laid out in the project brief were highly ambitious: performance at the peak of their respective displacement categories (675 and 800), maximum elasticity, low fuel consumption and a torque curve spread evenly across the entire power range. And unprecedented compactness: the three-cylinder MV Agusta engine, built to achieve all these goals, weighs just 52 kg, giving improved output flexibility and better load distribution on the axles, on both the new Brutale 800 Dragster and the other models that already possess this feisty in-line three-cylinder Italian engine. Key technical features include the shell-cast “closed-deck” crankcase with integral bore liners; the need for compactness has also imposed full integration of the water and oil circuits and the respective service pumps. Just as significant - and exclusive - is the choice of counter-rotating crankshaft, a solution with origins in the racing world where ride responsiveness has absolute priority, and the only judge of performance is the stopwatch. The counter-rotating crankshaft reduces inertia during changes of direction because it lowers that same inertia during deceleration; this enhances handling, the excellence of which is already a built-in top-priority feature of the MV Agusta chassis set-up. Compared to previous three-cylinder configurations, the one specially developed for the Brutale 800 Dragster focuses on fast-response, linear power output, putting a mighty roar into this roadster. 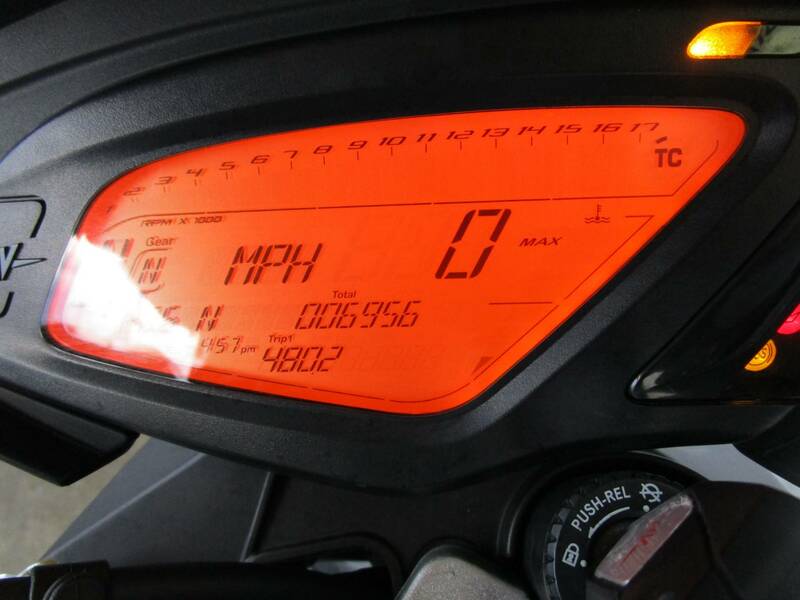 The 125&nbsp;hp power peak is reached at 11,600 rpm, while the maximum torque of 81 Nm comes at 8,600 rpm. Completing this highly sophisticated package is the removable 6-speed gearbox, with ratios designed to ensure awesome acceleration and a sports-category top speed should the bike be unleashed on the track. 59.74 ft. lbs. (81 Nm) @ 8,600 rpm max.